Dusshera is a celebration of the victory of good over evil. This celebration lasts for over ten days starting from Navratri and ends with the tenth day festival of “Dussehra”. This festival is celebrated throughout the country at the same time, with varying rituals and customs, but with great enthusiasm. 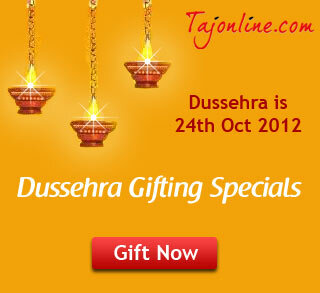 This year Dusshera is on 24th October, 2012. It is also called “Vijaya Dashami” or “Vijayadasami” as this day marks the victory of Lord Rama over Ravana. Many hindus observe a 10 day ceremony of fast, rituals and celebrations the victory. On this auspicious occasion people gift hampers which include sweets, dryfuits and flowers. Many people also worship idols of Lord Durga and Saraswati so gifting pooja thalis, gold coins or idols is also considered as a good gift for the occasion. Nine days of Navratri are celebrated all over the country, people play dandiya and garba. Gifting traditional clothes and jewellery is also a good option for the occasion. So celebrate the season of fun, fervor and festivities, your favourite gifting partner brings you greetings like no other. Indulge your friends and family with our eclectic mix of festive gifts. So while you’re enjoying each of the 9 nine days, we make it easy for you to spread the joy and cheer!